The Dort House was located across from the Flint Public Library and the Flint Institute of Music. The morning after the fire in the early seventies, Tom Pohrt and John Mucha took the bus from Civic Park to take photos. 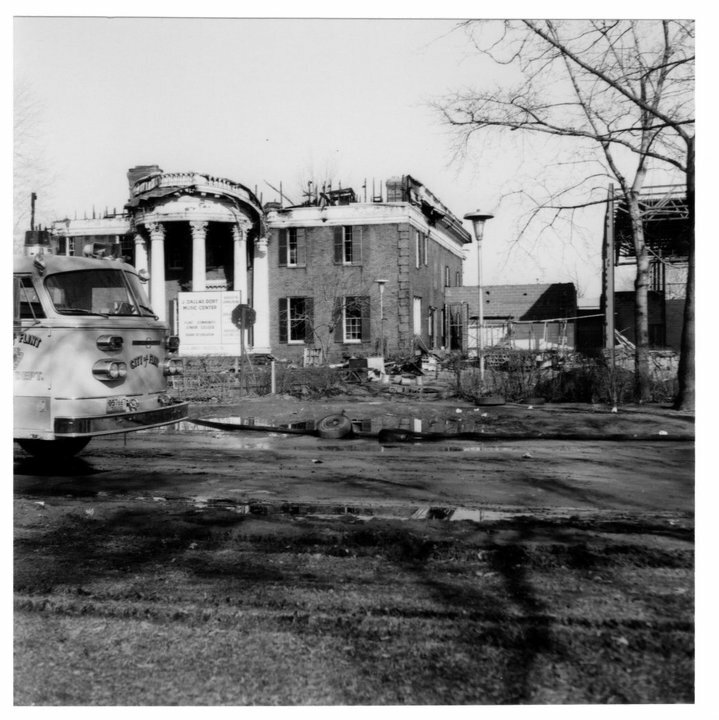 I was just a kid then, but as I recall, the Dort house was used as the original Flint Institute of Music, and was undergoing a major expansion, when the fire broke out. 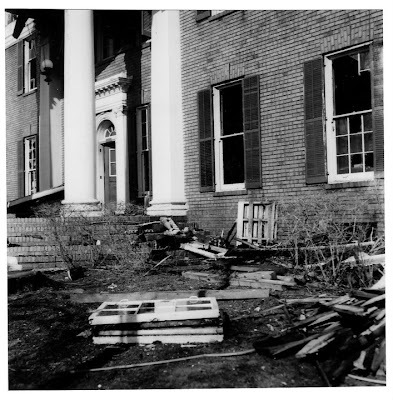 The historic home was to be the architectural centerpiece of the new facility, which was designed to surround and highlight the mansion. You can see the construction sign in the photos and a corner of the now existing building under construction to the right of the house. It would have been a beautiful setting and a great way to keep alive a physical connection to one of the most influential personalities in the history of Flint, (better than Dort Highway at least). In a bid to save some of the sheet music that had survived the fire, the community was asked to take piles of soggy pages, (wet from the fire hoses), into their homes to dry out in a race to beat mold and mildew from setting in. We had what seemed like a ton of it that we had to carefully separate, and then spread out anywhere we could find a flat spot throughout our house. Quite a bit of it had singed edges. A comparatively nondescript wing was built in place of the old house. 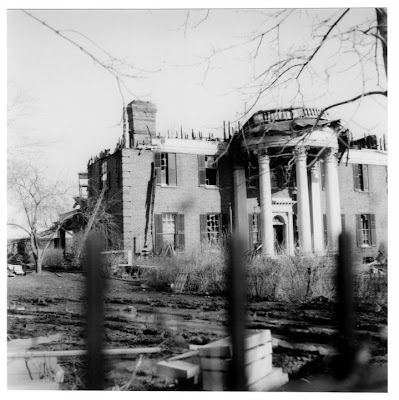 I personally consider this home to have been second only to Applewood in terms of the most significant historic residential resource in the city, and as a result of the tramatic fire, now a great cultural loss. Does anyone have the blueprints for the Dort House? It had some interesting features, such as a "panic room", at the right of the top of the main stairway looking up the stairway. At the back of a closet, a sliding door gave access to it. Since it's gone, I guess there's no point to not discuss it, since it's already been in the movies. The fire was in late winter '71, as I recall, (perhaps incorrectly) and I always thought it was a fire of convenience for the general contractor and the designers. If I'm wrong and the Flint Institute of Music was fully on board with the incorporation of the mansion into the contemporary building addition and the new cultural center environs and it was economically feasible and consistent with projected growth, ....well, it won't be the first time I've been wrong. On the other hand, tin-foil headgear notwithstanding, it wouldn't be the first nor the last time that preservation of Flint's history was given short shrift. Just look at what happened to Manning Court -- part of the Dort estate -- just a few years back. I remember a hidden room that one entered through a closet. The closet had sliding doors with the floor beginning about 2 feet from the floor. This must be the "panic room". It was very well hidden. So, you had to step up into the closet, slide open a back panel and then step down into the room. The only other panic room I ever saw was similarly situated at the back of a closet. It was in a house under construction in a subdivision of very large houses near Clarkston, where people lived who would have lived in Woodcroft Estates or off East Court St. in previous generations, but that's as close to Flint (or Detroit) as they now would want to be. Actually, Coolet's Dictum, a tinfoil hat only works if it completely surrounds your head, where the electromagnetic vectors all cancel. They actually did some tests at MIT and instead of shielding, it acted as a resonant cavity. They do put special shielding envelopes on certain RFID documents, so don't laugh it off completely. I have a set of the architectural drawings for the original Dort house around somewhere. I'll have to dig them out. John, thanks for the digging. I am curious about the panic room. I thought that was a thoroughly modern invention. I saw a huge house in Canada and the Ford House in Grosse Pointe. Both had alternate escape routes and plans. Didn't see a panic room, but there could have been. The docents didn't mention it. My recollection of the secret room is that it was dark and scary (It's really to early for Halloween stories, but that was my perception). I don't even know how large it was, or if it led to any other passageways. It would be fascinating if it did. It could have been just a safe storage room for valuables. But it's purpose as a secret room was apparent to me even though I was quite young. It just happened to be open. I didn't open it. I saw it while waiting for a music lesson. On other occasions, cetain hallways were open and I explored them. Sometimes, as I recall, access was locked to certain areas. There was an alarm system with metal arrows which pointed to where the alarm was activated. The control panel was mounted on a hallway wall. Anonymous....is right on the mark on describing the entry to a hidden room in the back of the Dort residence. It was located on the second floor and faced north toward the carriage house. I can't remember the size, but it was large enough to accommodate a bed and rest area. I saw it in the mid sixties. There were many stories floating around about it's early use. Panic room and hide away for someone in the family that was disturbed,and who knows what else was suggested. Mostly sinister stuff. A shame that it burned down. It was a beautiful, spare no cost construction. Okay, now I have to ask...how the hell did all you guys know about this panic room? Was the Dort House the preferred hangout of half the people in Flint? Musical ability is associated with intelligence. It is obvious that many of the people who post here are professionals-either by education or self taught engineering Bill Gates type skills. So half the people who post here were probably musical, and hence were in the building in the 1960s. Now, the musical half of you go pat yourself on the back and go to sleep. Geniuses need more rest. LMAO... their were others in the neighborhood too, but not for the same use I'm sure. "There" were others in the neighbor too".. Sorry, since we commentators are above average in intellect, we need to be grammatically correct in our delivery. I'm thinking of one residence across the street from Central that had a safe room for secreting individuals traveling the underground railroad. Also one on Alber Court behind the Ad. Bldg. Now we are getting way back there. Trumpet, baritone, e-flat upright tuba and sousaphone. Yes, unclebuck, I've noticed that the writers here are highly intolerant of bad writing, spelling and grammar. So I must correct my typo also. It's really TOO early for Haloween stories. Clarinet and Piano. (Incomplete sentence). My perception is that, while correlations between musical ability and general IQ may be positive, musical ability and written language ability are less strongly associated. I will be the first to attest to that, JWilly. Being self taught and mediocre at best. The kazoo is so under appreciated these days. Mathematics, Music, Foreign Language Ability, Computer Programming, etc. are more related to the Math Score on such tests as the old SAT. Verbal Score is more related to Writing, Theater, Law, etc. We had a (small) marching kazoo band at Michigan Tech. It was unofficial, and we accepted enthusiasm in place of talent. I hung around with an odd-but-community-minded group. We did a lot of stuff that we thought was helpful. Most of it was legal. Ah, those hazy, crazy, lazy college days. A slightly different mind set at Tech. JWilly Students at Northern aren't quite as creative. I like the football at NMU. The ice sculptures at Tech. and their US Geophysical Dept. I agree Grumkin. Many years ago during radio days entertainment, there was a program featuring a group called The Hoosier Hot Shots and their lead man played the kazoo. When they kicked off the show they always would say, "Are you ready Hezzy?" and he would answer with his kazoo. Five toots, four up and one down. You bet your sweet.... I don't hear much kazoo stuff on the radio these days. Unclebuck, you must have known the great trumpeter Garrett Ebmeyer also. There was a story that still survived on the internet until recently about the sheep that was found in the rest room at the northeast corner of Flint SW back in 1968. Garrett Ebmeyer was quoted. Reminds me a little of that stuffed animal story of Gordie's. Garrett Ebmeyer was principal when I entered Kindergarten at Longfellow, and when I graduated from SW.
Hmmm, I assumed that you started kindergarten at Neithercut. Mr. Ebmeyer was an outstanding musician and administrator. I vaguely remember the sheep story and the way it was spirited out the back entrance by maintenance people. I don't think it was somebody's mascot....Maybe, the Linden Lambs? There was a spate of off the wall happenings during that period, 68, 69, 70. Must have been something in the water because even the gentle hippie kids were out of character with some of their antics. Also, somewhere on this blog there was some mention of Gerrett's horn abilities and I tried to get hold of Jordy McCree and quiz him about it. He knew more about Flint's top musicians than anybody. I wasn't able to contact him. He was the best bass man in the state forty years ago. Unclebuck, I think there was a connection of the sheep incident and Elmer Engel's Bay City Central High Wolves as I recall. The incident happened prior to the Bay City Central game. There was speculation about the sheep being a wolf in sheep's clothing. I just had a friend, a middle lineman at SW pull out of the drive way this morning heading back over the bridge to Flint and I queried him about that incident. He and his brother, also a starter at that time, didn't have any pertinent information to add to the story, so the sheep's clothing story might be a stretch. These guys knew what was happening at that school at that time. We had a good laugh about it anyway. Do you know the final score of the game? The most memorable thing about the sheep was its unpleasant olfactory response. I was in Mrs. Sandell's Math Class right across from the rest room when it was removed. Mrs. Sandell was a no nonsense type of teacher and didn't think it was at all funny.